To track an order, please log-in to My Account. Scroll to "Orders" and choose "View Open Orders". Already logged in? Click this Order Tracking link. Search for your order using either a valid order number or search by date. Alternatively, you may track your shipment by visiting UPS.com and enter the tracking number provided. All orders are automatically processed on our secure merchant server and sent for shipment as soon as they are placed. During this process, we incur irreversible fees. Therefore, while we understand that orders might need to be changed sometimes, we are unable to do it free of charge after a certain point. 1. If you need to cancel your stock order BEFORE it has been shipped, please contact our Customer Service associates by telephone at 877-992-2247. 2. If you need to cancel your stock order AFTER it has been shipped, please follow our Return Policy. The cancellation will have to be treated as a Return with all applicable fees. 3. Orders which are REFUSED AT DELIVERY will be assessed all of the applicable fees listed above - including restocking, cancellation and other applicable fees. 1. If you custom print your order or request a product that is made to your specific dimensions, these items cannot be cancelled after you sign the proof. 2. If you cancel your CUSTOM order BEFORE proof signed, you will be assessed a cancellation fee. In the case of changes, the setup fees may vary from the original quote depending on your requirements. 3. If the order has reached the pre-production set-up phase, there will be cancellation or change charges that apply. In the case of changes, the setup fees may be different depending on your requirements. 4. If an item has begun the production step (which begins right after you approve the proof), unfortunately, we cannot stop or change the order. In case you want to prevent shipment or redirect it, this can be done, provided you bear the original amount quoted for all orders canceled at this stage. As an added convenience, now you can re-order frequently purchased item(s) straight from your order history. Simply log in, go to My Account and click All Orders. Locate the desired item(s), click on the "Re-order" link and enter your payment and shipping information. If you would like to receive an invoice, you need to register an account and create a password. Go to My Account and scroll to the Orders section on the left menu. Simply click on View Open Orders, select your Order Number, then view and print the invoice. You can also send an email to [email protected] or simply call 877-992-2247. If the product is already on the website, simply add the desired product(s) to your shopping cart by clicking Add to Cart or Request a Quote. This will take you to the check-out page. Under Payment Method, select Request Quote. This will generate a quote number and give you pricing (including shipping & handling charges). In accordance with current law, we are required to collect sales tax on all orders delivered in California at the prevailing rate of sales tax in each location. CALIFORNIA RESELLERS: California State requires all residents claiming resale tax exemption to fill out the California Resale Certificate (BOE-230 7-02). Just sending your "Seller's Permit" certificate issued by the state will NOT exempt you from sales tax. In order to be considered for sales tax exempt, all appropriate tax forms must be received prior to shipping/pickup-up of merchandise or you'll be charged the CA sales tax. If you qualify for a sales tax exemption please complete the sales tax exemption certificate and send it to our Accounting Department via fax at 951-710-1351 or email to [email protected]. For additional information, please reference the California State Board of Equalization. Please fill out the Tax Exempt form and fax it back to 877-992-2247 for more information. By becoming an Authorized Reseller, you can take advantage of APlasticBag's growing success. Resell our popular bags and packaging supplies to your customers. The APlasticBag.com Reseller Program is an opportunity for websites and resellers to earn money and grow their customer base through our extensive selection of stock and customized bags. Resellers will enjoy a product discount and powerful online tools to help them be successful. Click Here to read about the Reseller Program offerd at APlasticBag.com, or call 877-992-2247 for additional information. APlasticBag.com's National Government and Education Accounts Program is designed for Fortune 500 companies, government and education entities, allowing them to enjoy special volume purchase discounts. Our dedicated government support staff understands how government purchasing works. We utilize a vast array of manufacturing plants throughout the United States and can deliver all the products that your graphic arts company does not produce, at a discounted price! 5. An order management system that provides significant time and cost savings when re-ordering. 6. A dedicated customer service team focused on your satisfaction. We will accept art only in PC-compatible formats, created or drawn in these programs. No placed or embedded images will be accepted at this time. Convert all fonts to paths, curves, or outlines. To make it easier for all, the preference is Vectored Art created in Adobe Illustrator or EPS format Adobe Illustrator. The following formats are acceptable, but there may be a minimum clean up charge of $25. PostScript File (*.ps) If the type of file you have doesn't appear on this list, please send what you have and we'll do our very best to make it work! Important Note: A scanned image (e.g, .jpg, .gif, .bmp, .tiff, .psd, .pdf) or art created in a photo/paint/word program is not vector art. In addition, placing, linking, embedding, or copying these images into a drawing program does not convert them into vector art and will not meet our art requirements. Please submit your art file to receive a recreation fee estimate. **Tips: If your file size is too large, try to compress your file in software (WinZip for PC), all fonts and images must be embedded in the files. or copied to a disk, CD ROM, or Flash Drive and mailed to APlasticBag.com, 4023 Trail Creek Rd, Riverside, CA 92505. A Raster image is composed of a collection of tiny dots called pixels. When these pixels are small and placed closely together, they fool the eye into forming a single image. Raster images work well when subtle gradations of color are necessary. Because they contain a fixed number of pixels, a major disadvantage of Raster images is that their quality suffers when they are enlarged or otherwise transformed. They are also large in file size. When possible, use vector graphics created in a desktop publishing program. Vector images are different from photos because they use mathematical equations to define each component of the image. Vector graphics retain high image quality at any size. Flexographic Ink Imprinting is our most cost-effective printing method and is available on specified items (imprinting options are found on the product page). Flexography (often abbreviated to flexo) is a form of printing process which utilizes a flexible relief plate. It is essentially a modern version of letterpress which can be used for printing on almost any type of substrate, including plastic, metallic films, cellophane, and paper. 1. In-Line Flexographic Printing (Standard Run): Press prints only on one side, but can print on heavier materials, such as corrugated boards. Up to 8-color print available. 2. Post-Print Flexographic Printing (Short Run): A post-production environment is one in which imprinting takes place on a bag which is already constructed. Some restrictions exist with this method of printing, such as a fold or a gusset, which may restrict the available imprint area. In addition, a multi-color design imprints the colors individually, making it necessary for a space to exist between the colors. In-line printing does not have this space requirement. 3. 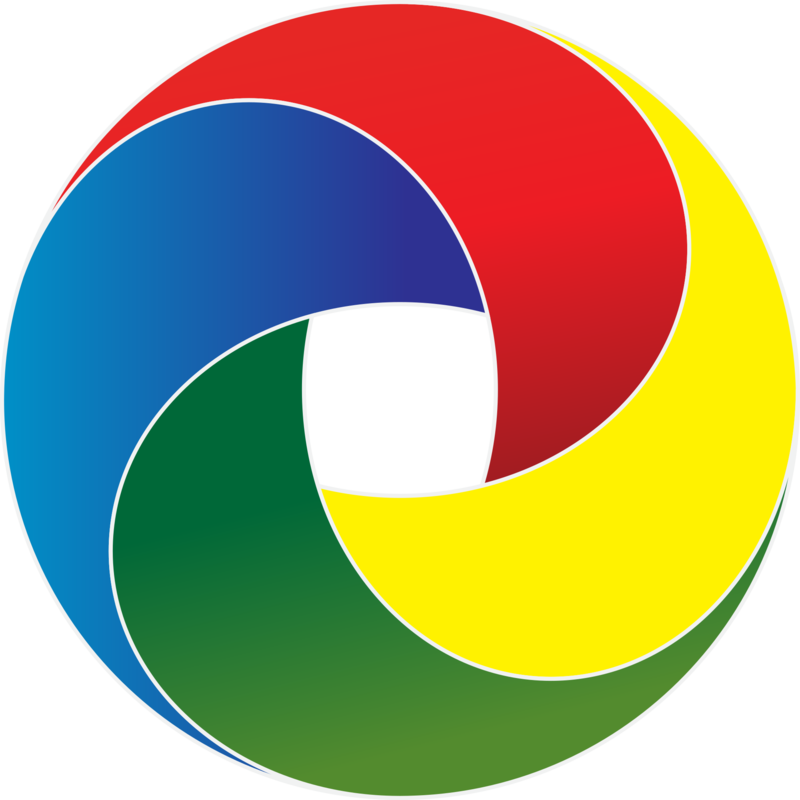 4-Color Process Flexographic Printing: Our printing methods use CMYK (Cyan, Magenta, Yellow, Black), also known as Four Color Process printing (or simply Four Color). In the CMYK method of printing, the 4 base ink colors create the design using varying sizes and densities of dots. Our Digital Printing uses an advanced inkjet technology to deliver an image quality comparable to 900 dpi printing in full color with 3x the resolution of standard flexographic printing. Full 4-Color Process Printing with superb image quality. Embossing is most often practiced for decorative purposes. Its effects are timeless, elegant, memorable, and lasting. It is often produced on larger solid areas and is known for its subtle broad features. Embossing forces (stresses) a material to create raised or depressed bumps. With embossed printing is a process where areas of paper are patterned by forcing fibers to move from pressure treatments. It is inherently a difficult process when the embossed impression contains fine line detail. Rush production is provided 1-7 business days after all approvals. All orders required for sure-dated events must be discussed with Aplasticbag before a firm commitment is made, and must be indicated on the sales order. Air shipments may be required in order to meet sure-dated-orders, at the expense of the customer or distributor. Non-sure-dated orders are approximate and all efforts will be made to maintain these dates. Orders requiring proof approval must respond within the time designated or the order may be delayed and will incur additional charges. Unfortunately, we are unable to accept consumer orders from outside the United States. For US Territories please call 951-710-1340. Aplasticbag.com will guarantee the shipment of in-stock items provided your order has passed our Credit or Accounting authorization processes. NOTE: We cannot be responsible for delays in shipments caused by weather, system failures, or other causes outside of our control. If additional information is needed to expedite your order, or for non-stock items, a representative from our company will contact you. *Most of our orders ship out within 48-72 business hours! If you need an item to ship faster than 48-72, please call us at 877-992-2247 and speak with a Customer Service Representative so that we can make sure it can be done. There are a couple of factors in this equation. You need to consider the time it takes to produce your item and the shipping method you selected. You order imprinted plastic bags with a production time of 10 business days and choose ground shipping. Ground shipments take 2-7 business days to arrive. So you have the 10 production days plus 2-7 days for shipment you have a total delivery time of 12-17 business days. Production time is based on receiving your order with a valid method of payment and correct design information. On orders where you have requested Samples and Pre-Production Proofs, production begins when we receive your approval and payment method has been cleared. All times are reflected in business days. Once the item is back in stock, your order will be shipped within 24-48 hours. For more information, please contact Customer Service 877-992-2247. To place a purchase order, please follow the check out process online by visiting Your Account. However, when you reach the Payment Information page, please select the Request a Quote option. Upon saving your quote, you will be shown a printable invoice. Please fax the invoice, along with a copy of your signed purchase order to 951-710-1351.